Pieces of Me: Rescuing My Kidnapped Daughters e-book hits #1 in Amazon’s Domestic Partner Abuse category. Writers Helping Writers publishes Lizbeth’s tips for managing book buzz. The Anchorage Press features Lizbeth’s story on Victim’s for Justice director Victoria Shanklin. Pieces of Me is released in audiobook by Vibrance Press featuring the voice of Suzie Althens. Pieces of Me is a USA Best Book Awards Finalist. See the full listing at usabooknews.com.Lizbeth is a guest on the National Association of Memoir Writers. Lizbeth publishes a humor essay in HerStoriesProject about parenting adults. Mamapedia asks Lizbeth about finding support while single-parenting. 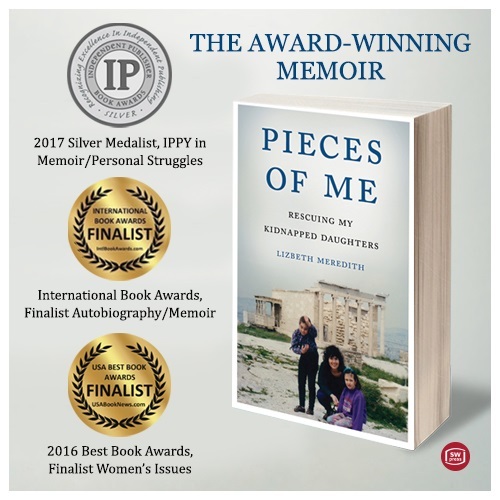 Pieces of Me wins a silver medal in the 2018 Reader’s Choice Awards. Lizbeth shares her story at Arctic Entries. Lizbeth gives a craft talk to 49 Writers on balancing the now and then in memoir. Pieces of Me is reviewed by thebooksage. Stories that Empower includes Lizbeth’s in their podcast. Lizbeth weighs in on the benefits of going to therapy in an article in Thriveworks magazine. KTUU’s Cover to Cover spotlights Pieces of Me. Tonic Magazine in Canada interviews Lizbeth about stalking and post-traumatic stress disorder. Lizbeth is interviewed by KTVA about Pieces of Me: Rescuing My Kidnapped Daughter’s Release. Sunlight Press publishes Lizbeth’s essay. Lizbeth is the guest at Interior Alaska Center for Non-Violent Living. Lizbeth’s story is spotlighted in Reader’s Digest. Zonta’s Alaska Chapter hosts Lizbeth as their guest author. Lizbeth is awarded the silver medal in memoir for the 2017 IPPY Awards. Lizbeth gives a reading for her Virtual Book Tour with Universal By Design. Fupping features Lizbeth on How to Attract Guest Bloggers to Your Website. Pieces of Me wins a 2018 Beverly Hills Best Book Award. Lizbeth is a presenter for the Writer’s Guild monthly meeting on hybrid publishing. Lizbeth is interviewed by Seattle King5 TV before the University of Washington Bookstore event. Author Virginia Simpson hosts Lizbeth on her blog. The University of Alaska, Anchorage hosts Lizbeth’s initial release party sponsored by UAA, AWAIC, YWCA Anchorage, Green Dot Anchorage, and Victims for Justice. A conversation about memoir writing with Soul Sciences Podcast between Lizbeth and Charlene Jones. Lizbeth’s essay is included in Jane Friedman’s newsletter for writers. The Catharine S. Eberly Center for Women at University of Toledo host Lizbeth for a book event. Motherly Love, a four-author mom-themed event, is held in Portland to a standing-room only crowd two days before Mother’s Day. Lizbeth presents workshops on hybrid publishing and writing memoir at the Alaska Writer’s Guild 2017 conference. Lizbeth shares how authors can manage their social media pages at Authors Publish. Moneyish interviews Lizbeth about How Working Women are Trying to Shed the Stigma of Menopause. KPLA’s Dog Eared Reads interviews Lizbeth. Pieces of Me is a finalist for the International Book Awards. Lizbeth is a guest on Great Day Live in Louisville. Lizbeth receives the Abused Women’s Aid in Crisis 2017 Achievement Award for years of service to domestic violence victims. Lizbeth enjoys an interview with Canadian podcast/thriller writer Donna Carrick of Dead to Writes. Raven Radio, Sitka interviews Lizbeth. Lizbeth is interviewed about single moms facing an empty nest.